Our luxury designer puppy collars are made from soft faux leather and waterproof linen. Handmade here in Britain these lovely puppy collars are the perfect choice for your new puppy. 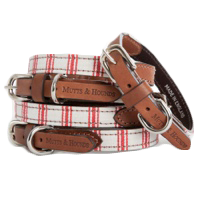 Choose from the very patriotic Barkingham puppy collar to the girly Posh Poodle puppy collar. Make your puppy's first collar a special one! Make that first collar a special one with our range of designer puppy collars. We have puppy collars suitable for every breed from the smallest to the largest. Choose a stylish fabric puppy collar that is fully adjustable and will see your puppy through puppyhood. Let your puppy sparkle with our range of luxury leather puppy collars covered in beautiful crystals, your puppy will dazzle all the other puppies in obedience class!